Kind post By Kavita Rayirath, Indian by Design. In conversation with Swati Kalsi. Indian By Design: What interested you in textiles? 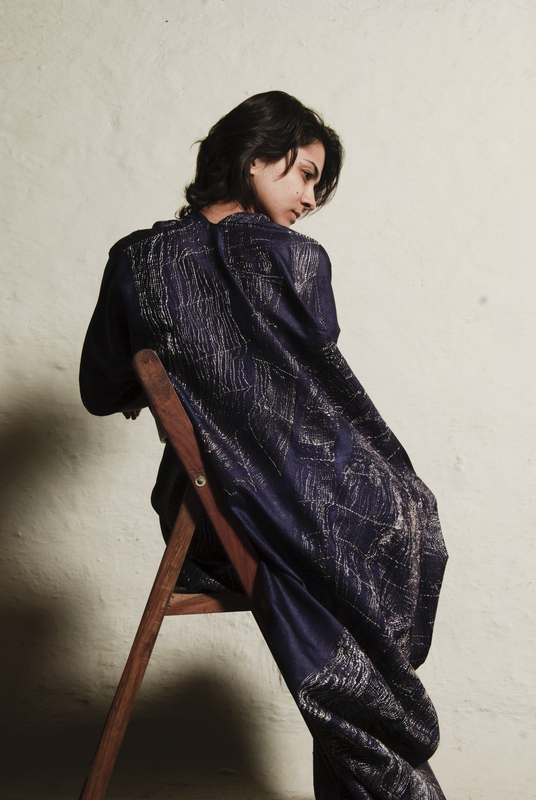 Swati: Handcrafted textiles always caught my attention. After years of working with them, I am all the more, in love with them. 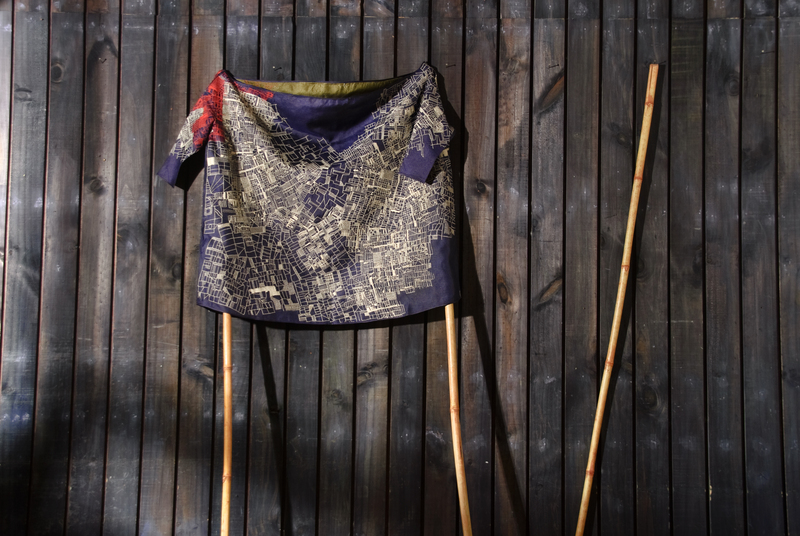 Intimately handcrafted textiles are poetic and graceful, with an evident patina. 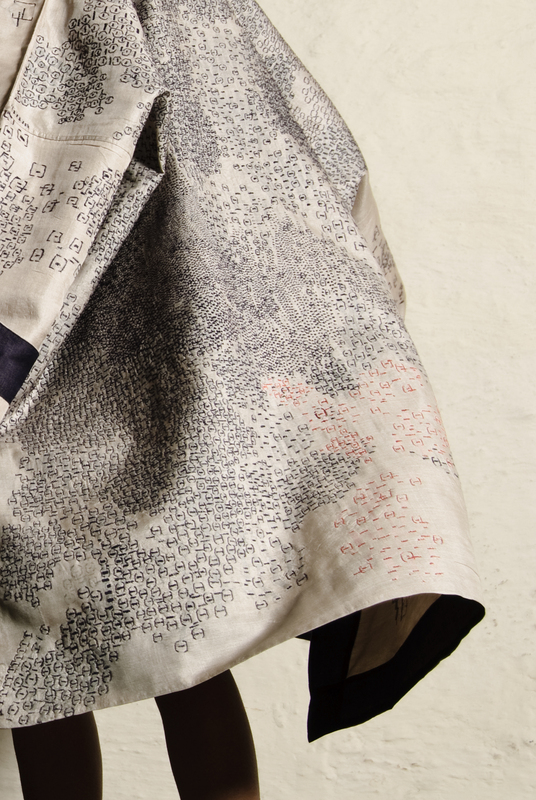 Indian By Design:The embroidered patterns are striking and subtle, they remind me of cartography and mapping. What brought about this form of embroidery for you? 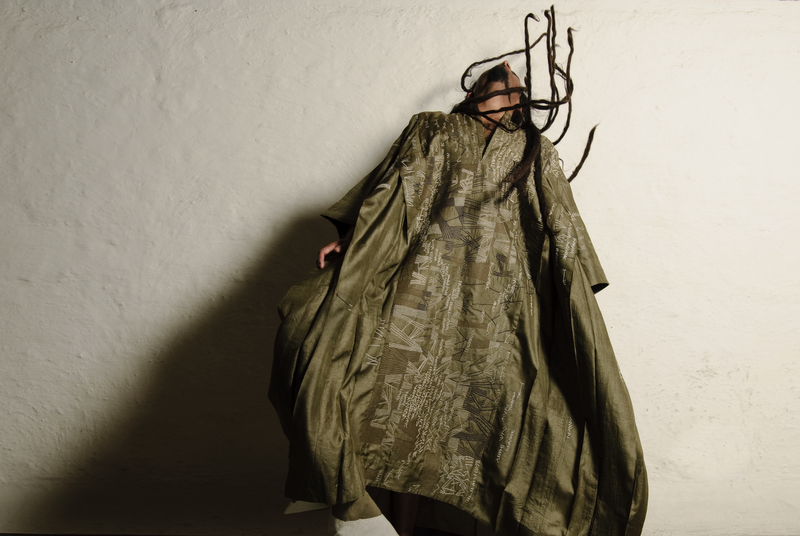 Swati: I feel profoundly inspired by nature and natural processes. Emerging layers, diluting depths, gradations, rhythms in nature always caught my eye and have gradually become my vocabulary for ornamentation. Digital media also presents an equally interesting array of visual vocabulary, be it data representation, graphs, mapping or cartography etc. Digital is just machine’s way of looking at what exists. My inspirations are transient but largely abstract and a lot happens over the process of ‘translation’, which is my input, and ‘creation’ that is while hands think and embroider. This form of embroidery has evolved, and hopefully will keep evolving over my repeated or new encounters with the environment around me and the traditionally skilled artisans. Indian By Design:The clothes in themselves are lovely – they seem cut for function and comfort whereas the embroidery and choice of fabrics bring in a sense of luxury and plushness. Was that a deliberate decision or did it evolve over time? Swati: The embroideries are done over intensely interactive workshops. 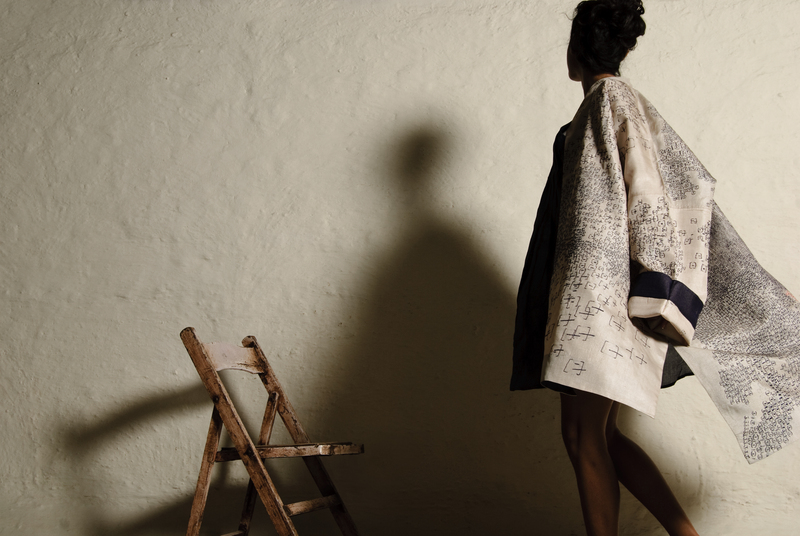 As a result, the textiles developed are very personal and intimate. This just makes them a luxury. My mind sometimes juggles between wear-ability and statement as purpose. And sometimes each embroidery calls for a certain silhouette and vice versa. So, one thing calls for the other, I’d say. Indian By Design:What is your making process like? Swati: I generally do my homework for a couple of months. Then my ideas (some vague, some more crisp) sit with the artisans. Over some very intriguing and interesting give and take, and inconceivable twists and turns we see the emergence of our products. The intensely collaborative and interactive creative process lends itself to unique experiences and outcomes. Indian By Design:How did the traditional embroidery makers you work with react to your designs when you first presented them? Swati: They thought I was insane and were very hesitant to even try. Now, in good spirit, they like to compete with each other, to impress superiority of workmanship and also like to name the pieces they create. Indian By Design:On being part of Jiyo – how did that come about, and what is all about and has it altered or enhanced the way you view your work? Swati: That was largely incidental. I was looking for something interesting to work on and jiyo! was looking for designers. Jiyo! is a unique programme for the holistic development of creative and cultural industries amongst the economically vulnerable communities of India, funded by the world bank, under the guidance of Mr.Rajeev Sethi, founder, Asian Heritage Foundation. This project gave me a unique platform to work closely with traditional artisans to position Indian women’s embroidery as an innovative and uniquely artistic cultural legacy. 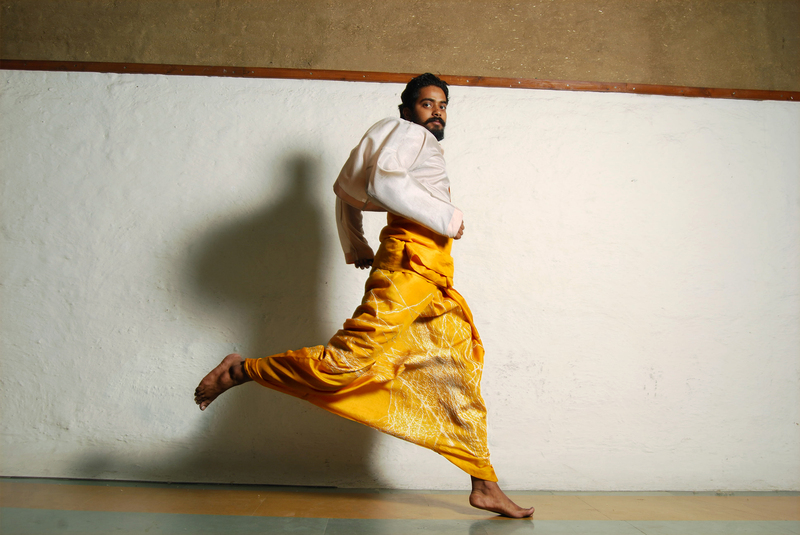 Mr.Rajeev Sethi’s vision certainly made me relook at craft in a different light. Indian By Design:What are you working on now? Swati: I am presently putting my ideas together for my next set of work. I’ll be more prepared for it soon. Indian By Design: What do you find yourself wishing for? Swati: I wish to continue working with the traditional crafts and artisans in the future too and keep taking the idea forward irrespective of the huge challenges. 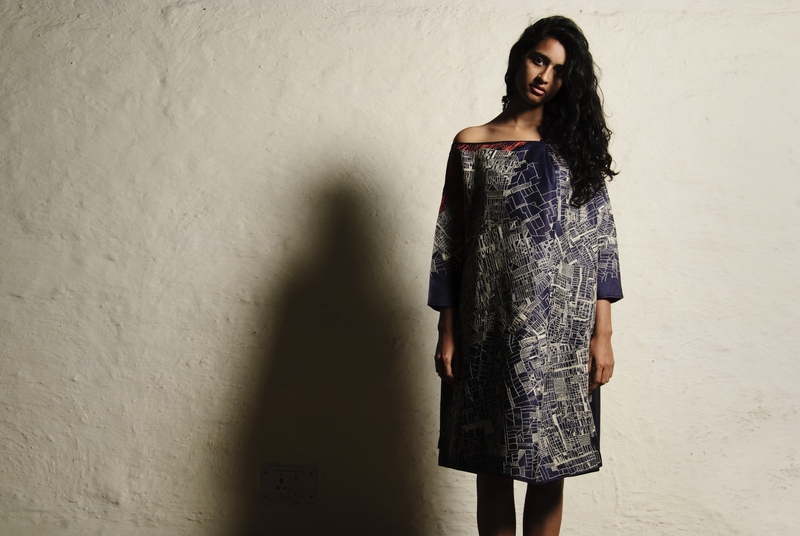 >> Swati Kalsi is a Fashion and Textile Designer, based in New Delhi, India. 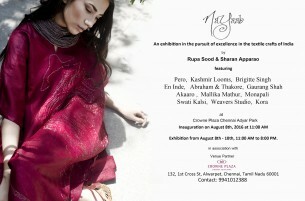 She works in close collaboration with traditional artisans in villages of India. She creates one-off pieces, works on private orders and does not retail. She can be reached via her website.